Note that the Lowepro Pro Trekker 400 AW has been replaced by the Lowepro Pro Trekker 450 AW. I love camera cases and backpacks (and have way too many), but I had not tried any of the latest-at-review-time Lowepro Pro Trekker series and have been very interested in doing so. Thus a Lowepro Pro Trekker 400 AW Backpack review was in order. 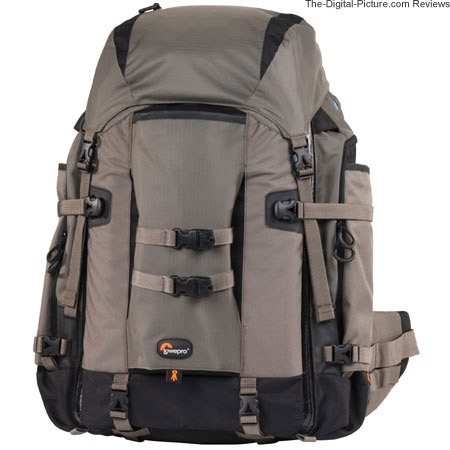 The Pro Trekker 400 is a replacement for the Lowepro Photo Trekker II AW Camera Backpack. The overall size of these two backpacks is very similar - my Photo Trekker is about 1" longer and wider, and slightly shallower. The functions they meet are also very similar. And for me, the most important functions for my large, most-frequently-used camera backpack are comfort, protection and capacity while remaining US airline carry-on qualified. 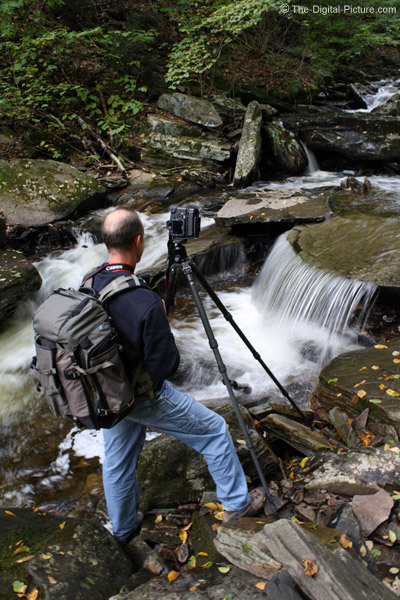 From a comfort perspective, the Lowepro Trekker backpack series has always been excellent. Large padded waistbelts, an adjustable harness system with well-padded shoulder straps and a padded backrest are the parts most in contact with your body. Along with the height-adjustable shoulder harness (the plastic pack-jack tool separates the Velcro and allows the should harness to be moved up and down), many other adjustments are available ("10 adjustment points") to customize this pack to your own body. The waistbelt is removable (shown removed above) for a more compact setup. So many adjustments are available that I almost needed a fitting consultant. Within a hike or two, I had my Lowepro Pro Trekker 400 AW Backpack's fit dialed in. And I really like the fit - even after carrying a heavy load for many miles and many hours. 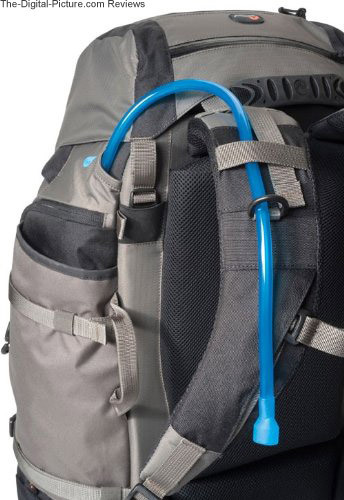 Being thirsty is uncomfortable and the Pro Trekker addresses this issue with space for your own hydration reservoir (not provided, shown below). An up-to 70 oz. (2 L) reservoir can be inserted into a side pocket as shown below (tip: use another fluid storage option in below-freezing temperatures). Notice the side (nylon) and top (rubber) handles shown in some of the above pictures? Getting a heavy pack on and off of your back can be quite uncomfortable. These handles make it much easier to accomplish this task. Remove one arm from a shoulder strap and, with the same hand, grasp the handle on the other side of the pack for support while the other arm is removed. They are also useful as carrying handles when you are not going far with the pack - including loading/unloading it from your vehicle. Protection is another area the Lowepro Trekker backpack series has been and continues to be rated highly for. 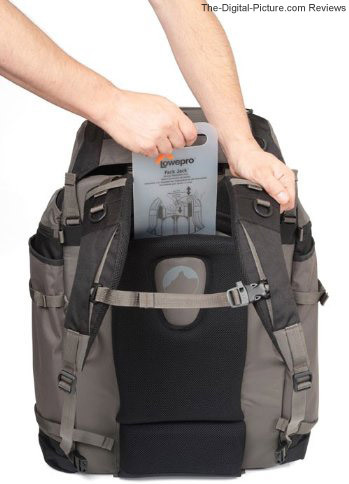 Not only is you body protected from the backpack, the valuable gear inside is well protected from exterior impacts (via padding and a tough nylon exterior) and the other gear itself (via Velcro-attached padded dividers). I am not worried about damage to my gear in this pack when traveling or hiking. 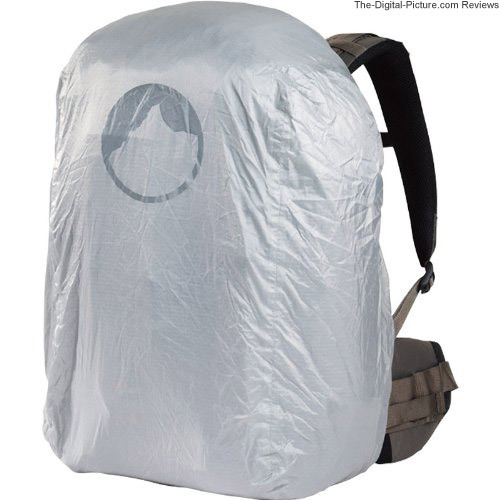 Full rain protection is provided by a lightweight rain cover that stows completely out of the way in the bottom of the backpack, but the pack is quite weather resistant even without the cover in place. I unintentionally proved this by getting caught in a rain storm while on a long hike. The pocketed backpack lid (it can be removed and used as a waist pack) is new with this series and sheds water (and other dirt) to the sides and back of the case. High grade, heavy duty YKK splashguard zippers enhance the seal. They are quiet, but they are not especially easy to open (though the U-shaped zipper pulls are very nice). I suspect more break-in time will allow the zippers to work more smoothly. I've heard too many stories about zippers failing to completely trust them with my valuable gear - especially if I'm counting on that gear. Just imagining the contents of a pack spilling to the rocks below turns my stomach. The Pro Trekker 400 has, in addition to the heavy duty zipper, 5 buckles (including two from the top lid) that secure the load extremely well and reduce the load on the zippers if tightened enough. Securing the 5 buckles, of course, takes some time, but doing so is good sense. Backpack capacity is, for the most part, a matter of selecting which model is right for you. 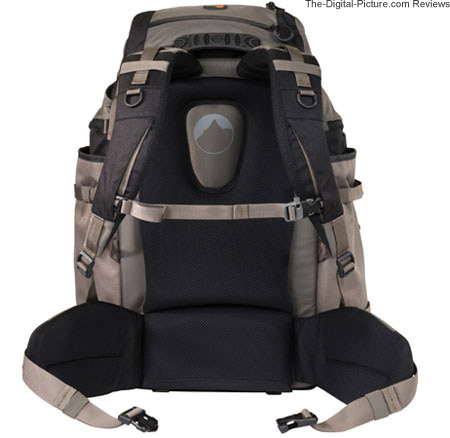 The premier Pro Trekker AW series camera backpacks are available in 300 AW, 400 AW and 600 AW in an attractive (my opinion of course) Mica/Black color as shown above. Here is how the Pro Trekker 400 sizes up with the alternative Lowepro camera backpacks (these are Lowepro specs). As I mentioned earlier in this review, important to me is that the Lowepro Pro Trekker 400 AW Backpack is US airline carry-on approved. This regulation alone is not hard to meet, but I also want to be able to carry as much gear as possible with me. So I'm usually looking for the largest available approved backpack. I have had the 400 on four flights including an RJA (Regional Jet Aircraft) flight. I had no problems carrying this backpack on board and it *just* fits under the RJA seat. Perfect. Lowepro Super Trekker AW II No Well above airline carry-on size. Lowepro Photo Trekker AW II Yes As of 07/2009 - with nothing attached to the outside of the bag. Lowepro Nature Trekker AW II Yes As of 07/2009 - with nothing attached to the outside of the bag. Lowepro Vertex 300 AW ??? Lowepro Vertex 200 AW Yes. As of 07/2009 - with nothing attached to the outside of the bag. Clothes and other gear can be lashed into the 8 compression straps around the side of the pack. These straps can be seen in many of the photos on this page. A camera harness can be clipped to the front. To carry a tripod on the backpack, slide two legs into the back sleeve and clip the two small back straps around the third leg. Experience teaches that it is best to re-clip these two unattached straps immediately after removing gear from them - they are easy to lose. Side attachment of a tripod is also available in a similar manner. I've been carrying a medium-large Gitzo GT3541LS Carbon Fiber Tripod with an Arca-Swiss Z1 Ball Head on my pack. I'm very pleased with how securely it locks into place. Missing from the Pro Trekker 400 are the abundant Slip-Lock attachment locations found on the older Trekker II camera backpacks. A small number of Slip-Lock attachment locations remain on the broad part of the waist belt, but other side and back pockets and features take the place of the balance of the attachment points. I have a pair of stainless carabiners attached to nylon loops on the bottom of my pack for attaching whatever I need to attach at any time - such as a ball-style cap. See-through pockets in the back of the main lid are available for small or thin items (small wrenches, microfiber cloths, sensor cleaning swipes ...) Additional side pockets and memory card holders are available. A laptop ("up to 15.4" widescreen" - my Dell XPS 14 fits comfortably) can be carried in an included zippered, padded sleeve that slides into the front of the pack where it is locked into place via the compression straps. 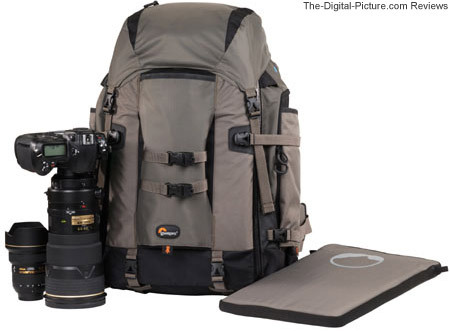 Lowepro advertises the Pro Trekker 400 to hold the following: "1-2 pro DSLRs with grip and lens attached (up to 400mm f/2.8); 4-6 additional lenses; 2 flash units; tripod or monopod; accessories and personal gear; up to a 15.4” widescreen laptop"
The longest lens that will fit in this case is the Canon EF 800mm f/5.6 L IS USM Lens. There is just enough stretch room to fit this lens (unmounted) in. The longest lens that will fit when mounted to a camera is the Canon EF 500mm f/4 L IS USM Lens. Again, this is a very snug fit. Lowepro helped me out by providing my review Lowepro Pro Trekker 400 AW Backpack (perhaps they thought my current backpack collection was showing some age) and its arrival was timed with several day hikes and a longer photo trip I had planned. 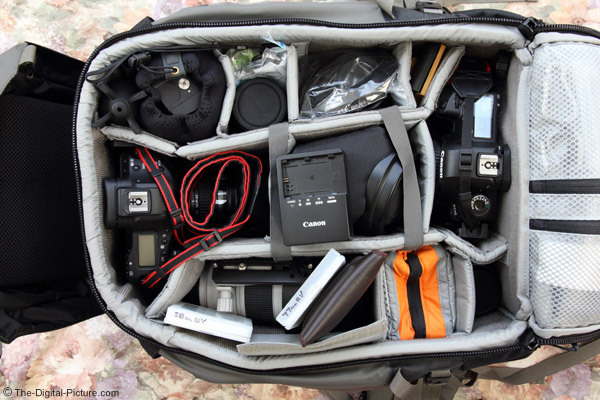 In addition, about 7 filters, spare batteries for both cameras, charger for the 5D II batteries, filter wrenches, some clothing, a light jacket and more are packed. All hoods are either reversed or packed beside the respective lens. Note that the lens hoods fit nicely in this backpack and that getting lens hoods into smaller packs is often a problem. 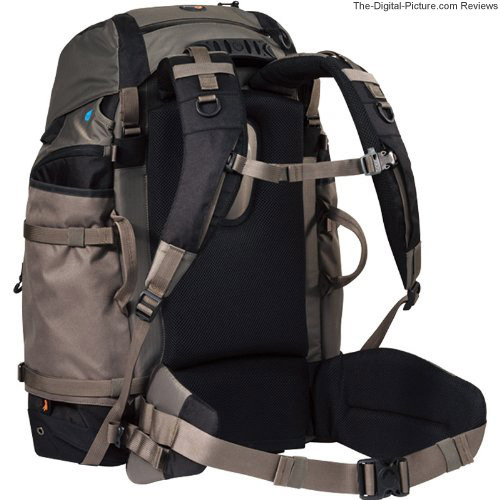 Also note that the above pack, as configured, weighs nearly 35 lbs (16kg) and is very noticeable on your back. 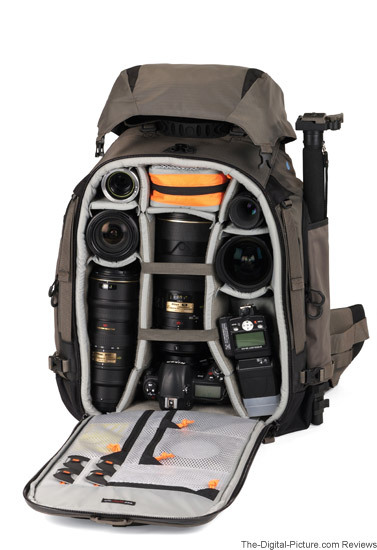 The Lowepro Pro Trekker 400 AW Backpack shown above has two full frame bodies (1Ds III & 5D II w/ grip), seven Zeiss Lenses, 10 filters and a Rocket Blower. Though there is plenty of space available in the above configuration, the weight was plenty for the trips I was taking. I carried this load on multiple day hikes, including a rugged 5 mile, 5 hour hike with plenty of elevation change. I was quite tired from the hike, but not tired of the pack itself. Is it worth upgrading an earlier Trekker II AW backpack to the new Pro Trekker *** series equivalent? Perhaps, but the previous series is still a very nice one. The tripod attachment is much improved on the new line - this is my most-appreciated feature upgrade. The rest of the improvements are nice, but not as big of a deal to me. So, I'll leave you without an upgrade recommendation in this case. 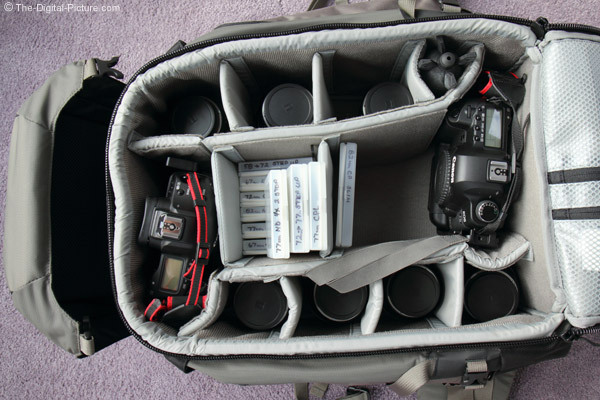 I have always recommended Lowepro products and continue to be very happy with them. My Pro Trekker 400, as I said earlier in the review, was provided by Lowepro, but I have purchased MANY Lowepro backpacks and cases including the entire previous Trekker II line and can very comfortably recommend the Lowepro Pro Trekker 400 AW Backpack if it meets your needs. This will be my primary backpack going forward.